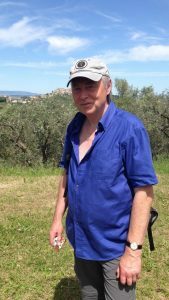 Here, Lawrence Thurgood tells how a combination of luck and good management enabled him to trace the family that had sheltered his father Robert after the latter’s escape from Sforzacosta PoW camp in the Marche, eastern Italy. After reading my father’s account of his escape once again, in 2014, I decided to make a concerted effort to find out more about it. So with the co-operation of Google, I put in a few late hours on the keyboard. The only place names mentioned in Dad’s account were San Lorenzo and Sant’ Angelo. The prison camp in the Marche, PG53, wasn’t where I had initially thought it was (apparently there had been an earlier one further south). Once I had established its location as definitely being at Sforzacosta (Macerata) I started expanding the search area from that point. I had no idea of distances and direction my father had travelled and there were a few villages around with similar names. I delved again into the shoe box containing the photographs he took on his return in 1948 to the “hills”, as I remember him calling the area – photos of the Italian families who must have helped him for many months after escaping from his ‘late home’. Turning over one photo of an older man, shouldering a rifle, with his wife and a dog, revealed the name ‘Luigi’, mentioned in ‘Scappata’, Dad’s account. There was another photograph of a woman with her small daughter, who was standing on a chair, presumably to give her some height for the photo. On the back was a name and what must be an Italian address. I typed this into Google maps and to my surprise instantly came up with a road of this name placed between two villages, with the names San Lorenzo to the north and Sant’ Angelo to the south… This had to be it! I dragged the map to get a picture of the ‘street view’. In this case it was a country road. I ‘dragged’ the picture around to give me a 360-degree view of the area and ‘hills’. Half-way round I stopped and focused on a skyline that seemed familiar. I once again dived into the shoe box of Dad’s photos and there it was, that very same skyline as if taken from that very same ‘virtual spot’ I was viewing from. I then recalled an email I had received a few years back from a guy called ‘Max’, as he signed himself on the email. Massimo Mangilli-Climpson was his full name. He had come across my Dad’s story, which I had previously photocopied and sent to one of his old comrades from the 5th Survey RA. It must have gone the rounds and been brought to Max’s attention. He had been researching for a book on the history of the RA Survey Regiments and had requested a copy. So Google came to my assistance once more and brought up the website to my screen. I sent a message to see if they would be interested in Dad’s story. I didn’t have to wait long for a reply from John Simkins, the Administrator, who was interested! I emailed him the scans of Dad’s story, which was in old 1948 typeface. He had written the story following a request for articles of interest to publish in a new bimonthly magazine to be started by Newcastle Breweries, where he worked. It was entitled “FROTH always on top! : The Blue Star Bulletin”. The first publication was in September 1948, just five years after the escape, so memories I guess, would still have been fresh. 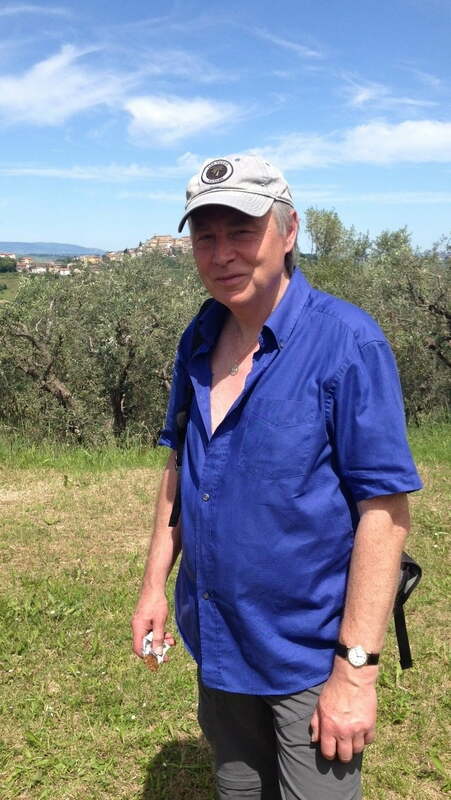 After further communication I was informed there was a Tenna Valley Trail event taking place in May 2014, based on Servigliano in the Marche, which as the crow flies was only a few miles south of the area where my father had spent many months evading capture. What a coincidence! So my adventures began. “Contact Roger Stanton if you want to go. He runs the WW2 Escape Lines Memorial Society, and can help you with flights, etc.” A guy called ‘Roger’ running an Escape line Society … Really! After the first contact I found that everything was fully organised; all I had to do was book the flight. Roger even organised my transportation from my house to his, then on to the airport.‘Boris’, another ELMS member, just happened to live up the road from me. What were the odds! John and Roger also had a local contact, Ian McCarthy, in the area to be visited. Ian was able to contact the family who had helped my father, using the photographs forwarded to him, proving to be an icebreaker for the initial contact. There were two members of the original family still alive and still in residence at the farm. So, a couple of days in, after a particularly gruelling hike in ‘the hills’ at a rest stop, with a cold bottle of coke in one hand and a half finished gelato in the other, Ian said: “Right, we’re off to visit the family now!” I quickly guzzled the coke and wiped away the residue of gelato from around my mouth as I followed him to his car. Thirty minutes or so later, I found myself walking down a narrow, white-gravelled track towards a small farm, situated atop a valley, which fell away to my left, with that very same skyline from that 1948 photograph as a backdrop: the same track my father must have travelled many times. We were welcomed at the gate and invited in. 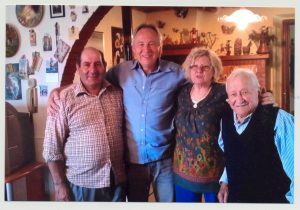 In the farm house I was introduced to Giovanna, that little girl who was standing on the chair in the photo, and Romolo, who was one of Luigi’s sons, 95 years of age. He remembered my father well. I was seated at the kitchen table next to Romolo who explained via Ian that I was sitting in the very same spot where my father had been and slept all those years ago. I was choked, to say the least. Romolo was in good form for 95 and asked about one of the other escapers, ‘Lesley’, who had been there at the same time. By this time a few more locals had appeared, presumably to see the Inglese person. For a while to me, it seemed like ‘surround sound’ Italian, with everyone talking at once while Ian tried to convey information and translate to me at the same time. Just off the kitchen I was shown the wine cellar with a stone floor, which had remained unchanged from my father’s time. The wine was tasty and was looked after by Louie, Giovanna’s partner. However, time was short as I was now to be whisked off to the prison camp that Dad had left behind all those years ago. As I was preparing to leave, Romolo asked if I would like to return for lunch on the Sunday, an invitation that I readily accepted. After another 20 minutes I was entering the very same arched gateway of Campo Concentramento PG53 at Sforzacosta as my father had done, albeit in different circumstances, over 71 years earlier. We walked around four large, slightly-domed roof warehouses that were once part of a linen factory before being converted to accommodate over 8,000 prisoners. Since then some had been used for industrial purposes but all seemed abandoned now. We managed to access one and viewed the tall, domed-ceiling structure from the inside. It would have been closely packed with three-tier bunks for 2,000 men. Continuing on to the rear of the camp, which would have been a roll-call field, we came across an old Italian gentleman tending a small garden. It so happened that his mother used to work there when it was a linen factory and he was at and around the camp when he was aged seven or eight. He remembered events that he conveyed in detail and with some emotion via Ian. Well, it had been one hell of a whirlwind day for me, one that I will never forget, thanks to the Monte San Martino Trust and ELMS. On returning to the hotel in Servigliano I felt both tired, emotionally drained and elated, so a couple of large grappas were recommended. On returning to the farm for Sunday lunch, along with Ian’s wife Gabriella, who kindly offered to help out with translation, Romolo offered to show me Vincenzo’s farm, while waiting for the lunch to be prepared, as it was just down the road. According to Dad’s memoirs he had stayed there on a number of occasions. The farm was still apparently owned by Vincenzo’s descendants but was only used in summer months. On returning, Giovanna had put on a fine spread with Louie cooking home-made sausages and rib on an outside stone BBQ. Fantastic! The food tasted as good as it looked and I was soon stuffed full. We got to know our histories a little better over a glass or two of Louie’s delectably smooth vino cotto. Unfortunately, time again was our enemy, with Gabriella having to take care of some unforeseen business and myself to be returned to the hotel for a last-night dinner celebration (if I had the room for it) before my trip back to England. So ended my short adventure into my father’s past, a past that seemed to have given me a behind- the-scenes helping hand, with coincidences and timing at every turn connected with my journey to Italy, from the day of my first contact with the Trust. It was good to see that the ‘kindly, warm-hearted, hospitable host of Italians’ mentioned by my father over 70 years ago, had remained the same.